The 1958 Bump which occurred on October 23, 1958 was the most severe “bump” (underground earthquake) in North American mining history. The 1958 Bump devastated the people of Springhill for the casualties they suffered; it also devastated the town, as the coal industry had been its economic lifeblood. The No. 2 colliery was one of the deepest coal mines in the world. Sloping shafts 14,200 feet (4,300 m) long ended more than 4,000 feet (1,200 m) below the surface in a vast labyrinth of galleries off the main shafts. In the case of the No. 2 colliery, the mining techniques had been changed 20 years before this disaster, from “room and pillar” to “long wall retreating” after reports documenting the increased danger of “bump” phenomena in the use of the former technique. The bump spread as three distinct shock waves, resembling a small earthquake throughout the region, alerting residents on the surface over a wide area to the disaster. 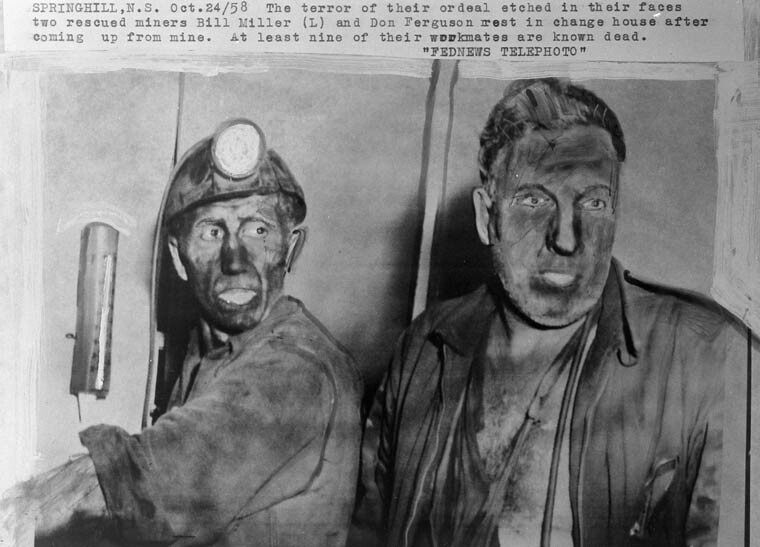 Dräger teams and teams of barefaced miners entered the No. 2 colliery to begin the rescue effort. The rescue teams encountered survivors at the 13,400-foot (4,100 m) level walking or limping toward the surface. Gas released by the bump was encountered in increasing concentrations at the 13,800-foot (4,200 m) level where the ceiling had collapsed, and rescuers were forced to work down shafts that were in a partial state of collapse or were blocked completely by debris. Any miners who were not covered either in side galleries or some other shelter were immediately crushed during the bump, the coal faces having been completely destroyed. 75 survivors were on the surface by 4:00 am on October 24, 1958. Rescue teams continued working, but the number of rockfalls and amount of debris slowed progress. Meanwhile, the Canadian and international news media had made their way to Springhill. The disaster actually became famous for being the first major international event to appear in live television broadcasts (on the CBC). As the world waited and those on the surface kept their vigil, rescuers continued to toil below the surface trying to reach trapped survivors. Teams began to arrive from other coal mines in Cumberland County, on Cape Breton Island and in Pictou County. After five and a half days (placing it around the morning of Wednesday, October 29, 1958) contact was established with a group of 12 survivors on the other side of a 160-foot (49 m) rockfall. 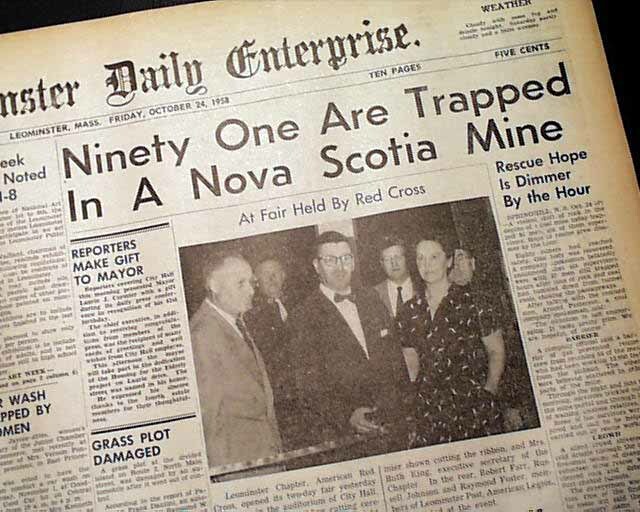 A rescue tunnel was dug and broke through to the trapped miners at 2:25 am on Thursday, October 30, 1958. On Friday, October 31, 1958 the rescue site was visited by various dignitaries, including the Premier of Nova Scotia, Robert Stanfield and His Royal Highness Prince Philip, the Duke of Edinburgh who had been at meetings in Ottawa. On Saturday, November 1, 1958 an additional group of survivors was found; however, there would be no more in the following days. Instead, bodies of the dead were hauled out in airtight aluminum coffins, on account of the advanced stage of decomposition, accelerated by the Earth’s heat in the depths of the No. 2 mine at 13,000–14,000 feet (4,000–4,300 m) from the mine entrance. Of the 174 miners in No. 2 colliery at the time of the bump, 74 were killed and 100 trapped but eventually rescued. I Was 8 At the time –In JUNCTION ROAD SCHOOL !! My DAD was Among the First group of “BAREFACED” Rescuers –He Never Came home Until the LAST Body Came Out — He –MATT PERSIN — Worked in the Mines for 32 Years up until that Time — His Shift was The Very Next One -so he was On his way to Work when the BUMP hit !! – So Many Memories !! I was a teenager living in nearby Amherst at the time and remember well this great disaster. A number of the victims were relatives, so there was great angst for us all. Thank you for visiting the site and taking the time to share your memory. Although I am in Ontario, I recall it very distinctly as well. Everyone was glued to the radio and newspapers (we didn’t have TV at the time) to see if they had rescued anyone else. It was a tragedy indeed! I received a comment from Harold Brine addressed to “Don,” so I am presuming it is you. The comment reads: Hi Don, Harold Brine here, I am still here at 84 years of age. I was with the group of 12 trapped, I am the only survivor left. I was only 26 yrs., old then and thought I’d never see the light of day again all I thought of was will my daughter remember me. I ‘am truly Blessed to be here today. My thoughts are still with our brothers we lost and after. I think out of the group of 8 trapped Herbie Pepperdine is the only one left from that group. I left Springhill in 1958 for Toronto,Ontario arriving there New Years Eve 1959, with my then wife Joan Comier-Brine and daughter BONNIE Brine-Cole who was only 2 & Half years old.Who lives in Erin, Ontario. I am truly Bless I have two beautiful and wonderful Grandchildren Darren Cole lives in Acton, Ontario with his wife Sheri & Great Grandson Andrew Cole, Granddaughter LuAnne Cole in Barrie,Ontario, my loveing wife Murriel Campbell-Brine, we live in Geary, N. B. Where we retired. I have had a lot of heart problems as I am not all that well, but still able to get around a bit. You no it is interesting out of all the books that have been written I have never been interviewed it’s interesting what they have written about me. Well when all said and done I do appreciate all the people out still thinking of us God Bless you and all. May I ask you are you the son of Merle, God Bless Harold. Hi Don, I’m Afnan. Me and my peer Sarah are doing a heritage fair project on the Springhill Mining Disaster and we were wondering if you would be willing to do an interview on the topic. This morning I read the article on the 1958 Springhill Mine Disaster, with tears of remembrance. I was 11 when the “Bump” happened. My Dad, Alfred Legere, was one of the 74 men who lost their lives on that tragic day. He was 49 and left behind 11 children and his wife, Margaret, to mourn. Such a sad time for our town of Springhill when so many lives were changed. Thank you Gerry Burnie for this article and for remembering. Thank you for visiting my site, and for your remembrance. A very sad event, indeed. To remember those who have passed before is to make them live again; therefore, it is important that we remember their lives and contributions. I was born in Springhill and in 1956 I was 16. It was a horrific time. 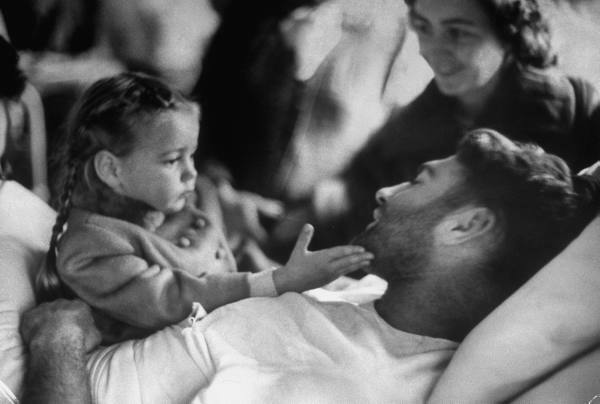 I was also there in 1958. Our town has suffered. Thank you for visiting my site, and for taking the time to comment. Yes, Springhill has seen its share of tragedies;therefore, it is important to remember with respect for their sacrifice. To remember those who have passed before is to make them live again. It was a terriable time for all of us. Thank you for visiting my site, and for your comment. Let us live long and remember. Hi Don, Harold Brine here, I am still here at 84 years of age. I was with the group of 12 trapped, I am the only survivor left. I was only 26 yrs., old then and thought I’d never see the light of day again all I thought of was will my daughter remember me. I ‘am truly Blessed to be here today. My thoughts are still with our brothers we lost and after. I think out of the group of 8 trapped Herbie Pepperdine is the only one left from that group. I left Springhill in 1958 for Toronto,Ontario arriving there New Years Eve 1959, with my then wife Joan Comier-Brine and daughter BONNIE Brine-Cole who was only 2 & Half years old.Who lives in Erin, Ontario. I am truly Bless I have two beautiful and wonderful Grandchildren Darren Cole lives in Acton, Ontario with his wife Sheri & Great Grandson Andrew Cole, Granddaughter LuAnne Cole in Barrie,Ontario, my loveing wife Murriel Campbell-Brine, we live in Geary, N. B. Where we retired. I have had a lot of heart problems as I am not all that well, but still able to get around a bit. You no it is interesting out of all the books that have been written I have never been interviewed it’s interesting what they have written about me. Well when all said and done I do appreciate all the people out still thinking of us God Bless you and all. May I ask you are you the son of Merle, God Bless Harold. What an honour it is to have you visit my site, and to have your comment as well. I cannot even imagine what it must have been like to be trapped underground and wondering about your survival. But, what joy it must have been to see the light and freedom once more. I rejoice that you made it and that you can still tell the tale. the lady manning the post office to one of the mine heads. What an incredible reception we were given when we finally made it to the mine head. It was about 4:30 in the afternoon on an early August afternoon. We must have talked with over a dozen miners. Each one of them were gracious in sharing their stories of 1957 and 1958. I still think of these men today and wonder what ever happened to them. I was 12 years old. I’m 63 now. I still have a large piece of anthracite that I was given to me by one of the miners. Boy did my Mom ever get our vacation right. She said a vacation is about keeping memories. That day is etched in my mind forever and ever. God bless all these men. There is also another connection to Springhill NS. My brother and I have worked on all the Anne Murray Television Specials on CBC-TV in the 1980’s and 90’s. Also Rita and Friends with Rita MacNeil . I was in CBC studio 40 when “Working Man” was filmed with the miner’s choir here in Toronto. Having visited Springhill that August day in 1965 as a young boy gave such special meaning when the miners backed up Rita. Just thought I would share this amazing story with you. Thank, Corey, for sharing such a lovely reminiscence. On your trip east, you took very much the same route as I do – crossing a Gananoque and through the northern states. A beautiful trip. Anne Murray, Rita McNeil and the Men of the Deeps bring back memories, too. I believe I first saw Anne Murray of the Don Messer show – well before she became a star. Very nice to hear from you Gerry. I don’t know what triggered memories of Springhill couple of days ago. I will never forget talking with those miners. Real men. Do you know what I mean by real. It seems as though people like that don’t exist anymore. Yes Anne Murray did first appear on Don Messser. I got to work with the technical producer that did the Messer show in Halifax…late fifties – sixties. Our family really enjoyed that show. Half an hour once a week on a small portable black and white TV. Where do you live Gerry? I used to do a lot of business with a magnetics company in Gananoque on Herbert Street. Do you remember the old A&P on main street and the Gananogue Shipping Lines. Great memories. The company on Herbert Street was probably Gulton Industries and the A & P (previously the Dominion Store) is still on the main street – its a Metro now. Gananoque Boat Lines still doing a booming business every summer too. My mother’s family originated in Nova Scotia and although she had married and moved to Ontario by the time the disaster in Springhill took place I can remember waiting for the magazine section of the Toronto Star to arrive on Saturday so we could see the colour pictures of the mine disaster and the town and carefully reading the copy in the off chance that the name of a relative or friend might appear. Its one of those occurrences you never forget and which pops up in conversation every once in a while. when they finally closed. Would Fred Roney or Shirley Eastman who worked there ring a bell with you. latching two wooden doors together and sliding from the highest point of the sinking ship down a rope. What is your connection with Gananogue? I was touring through Eastern Canada in 1976 when I saw the sign for Springhill. The song about the disaster came to mind. I headed for the site wondering if this was the same Springhill. I had a great visit with the retired miners. Both my grandfathers were West Virginia coal miners and I inherited a fascination with everything coal. When I mentioned my grandfathers the guides were especially welcoming. Even though the work is hard and dangerous my grandfathers loved it. I may never understand that but I loved visiting them in West Virginia and being around coal towns. Springhill was the high point of my tour thanks to the wonderful people there. I’m glad I found this site. Thank you for vising the page, and for your comments Lowell. Yes, it is good to learn our history and appreciate what our forefathers went through to leave what we enjoy today. Hi , My name is Carman Graf I now live in Smithers BC I am 81 yrs old I worked in #4 mine from Sept 1953 until march 1954, my forman was MUIR McKAY,the under ground manager was GEORGE CALDER.I was transferred to #2 mine in March of 1954,the forman was ART NOILS we didn’t get along very well so I quit and came west my dad GUS GRAF worked in #4 mine for many years e had just came up from #4 mine in 1956 just before the explosion just missed that explosion by minutes he never went back I worked on the pan line for 5 months then was put on a tugger until I got transferred to #2.it was a great experience however I am glad I left when I did as I was on the opposite shift as my dad and I could have very well been down the mine when it happened great article I have been back many times and I always go down the museum mine. Thank you for taking the time to comment. The ‘Springhill Bump’ post has struck a chord with more people than any other. It was a tragic event that touched many peoples’ lives – especially in a small community where everyone was either related to or knew the victims personally. That is why it is important to keep the memory alive as a living memorial, and you reminiscences certainly help. Thanks again, Gerry B. My father, Orville (Slushy) Neville took the ambulance from Pictou, N. S. To Springhill to help with the removal of miners to the hospital. Hi gentlemen. I post you from the UK. I am a folk song fanatic and have always enjoyed but respected the song recorded by many singers of story of the disaster at Springhill. Recently a tv presenter here was making a travel feature using the railways of Nova Scotia. On one particular programme he commenced his journey in the town and I thought it would feature the story but sadly it was not the case. Subsequently I have researched the sad event and realise what a far reaching disaster it was. I respect with great dignity those who went underground to hew the coal on our behalf and their families who supported them. Hello John: Thank you for visiting In Praise of Canadian History and for taking the time to comment. Yes, the Springhill Disaster seems to have struck a chord around the world. The days it took to rescue the miners were truly tense as we waited, hoping the best for them every day. It seems to be a landmark event for everyone. Thanks again. Gerry B.